The first robot parking garage to be opened in New York city will be ready for business this month. You can find it in Chinatown. 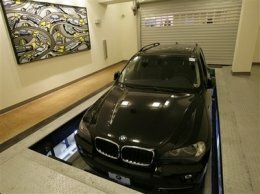 The developers of the "robot" can now fit 67 cars in an apartment building basement that would ordinarily fit only 24. Here's how it works: first, you park your car on a pallet and get out. The pallet is lowered into the "garage" and then positioned in an open space. It's all computer-controlled; it costs about $25 per day, which is competitive with other non-robotic parking in NYC. If you're thinking of buying the Robopark.com domain, you're too late; it's owned by Robotic Parking. They are a US-based firm that opened the first fully automated parking garage in Hoboken in 2002. 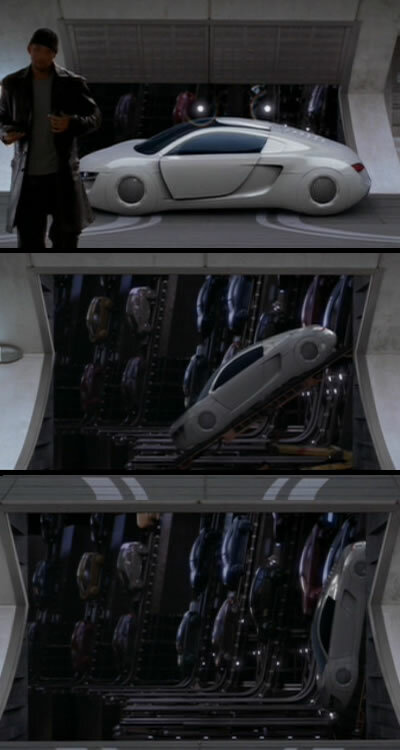 The recent movie I, Robot also featured a very well-drawn automated parking garage. Will Smith is shown below "parking" his futuristic Audi. As with other software-controlled devices, problems can occur. A software "crash" in a robot parking garage can actually damage your car. The Hoboken garage dropped an unoccupied Cadillac Devile six floors in 2004.